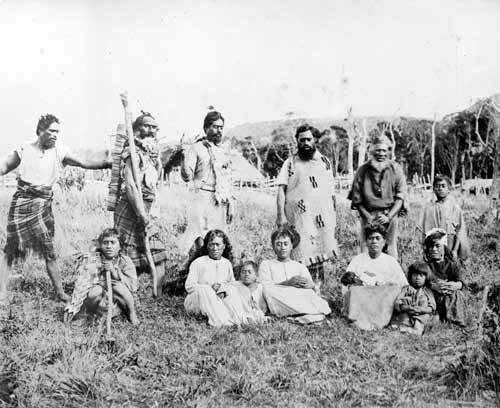 Among these Moriori people, photographed in 1877, were survivors of the 1835 Māori invasion. Hirawanu Tapu (second left, standing), Rohana (second left, sitting) and Tatua (second right, standing) were adolescents at the time, and endured over two decades of slavery. Descendants of survivors include Wari Tutaki (left), Teretiu Rehe (third left, standing), Rangitapua Horomona Rehe (fourth left, standing), Piripi (far right), Ngakikingi (middle, sitting) and Te Tene Rehe (next right). Permission of Canterbury Museum, Rolleston Avenue, Christchurch, New Zealand must be obtained before any re-use of this image. I am a direct descendant of Riwai TeRopiha, who features in most books written on the Moriori. I am his great grandaughter, my father is Joe Rewai (born and raised in the Wairarapa) my grandfather (Riwai's son born to his only wife Kitti Karaka) who was taken from the Chatham Islands (Rekohu) by Kitti as a young lad and raised in the Wairarapa. I, along with my father and siblings, travelled to the Chathams in 2000 to meet whanau and visit all the sacred sites now protected and no longer accessible. We took and planted our karaka tree sapling and returned back to Masterton with a karaka sapling which flourish's over the grave of our nanny at Queen Elizabeth Cemetary. Moriori endorses the covenant of peace, which I proudly encourage for all mankind. A friend in New Zealand sent me a link to this website. This is the first I've heard of the Moriori and their amazing, and tragic, history. Reading how such a peaceful people could suffer such devastating treatment is sad beyond belief. And reading the other comment from Christopher Peihopa, who writes about his own Moriori ancestors, is evidence of how recent these events were. I can only hope that whatever legal remedies are still being decided will go in their favor. Hi my name is Christopher Peihopa im not sure how far back she was ( Ani Uru) but i was told that she was taken as a slave from the Chathams into Taranaki in the 1900s. Some where along the way my three great grandfather Matene Totara Teretimana thats all i knew about my Hanau. Anyway my aunty whos name is Katarina Matene Totara Teretimana who is still alive today. She actully did a documentary about 2years ago you should look into it I have a copy of it as well. Im sori if I was'nt supposed to write in this section. Thanks.